Large Popcorn, No Butter: Snowpiercer: Because Bastille Day. For those of you who may not be aware, Bastille Day is basically the French equivalent of Independence Day. So called over here (in France they just call it July 14th Day, much like our Fourth of July) because of the storming of the Bastille that set off the whole French Revolution, it commemorates France's political switch from monarchy--woo! So what better day to watch a revolutionary tale than Bastille Day? 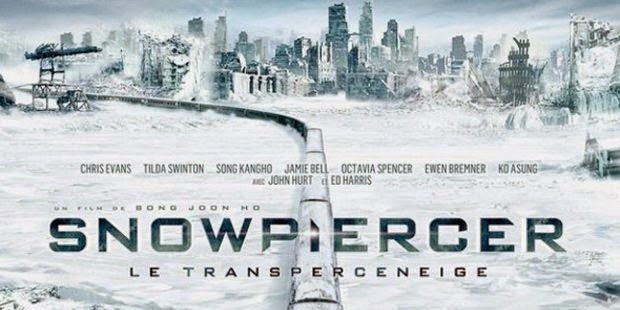 Snowpiercer is the tale of a train. In a post-apocolyptic world, the train is the only thing holding the remnants of the world's population. After humans released a chemical into the atmosphere to remedy global warming, the plan backfired and sent the world into another ice age. The train is all that is left. Circling the world on a series of interconnected tracks, it is kept running by one thing and one thing only: "the eternal engine." But all is not so well on the Snowpiercer. Passengers living at the tail of the train are having a hard time surviving, and have been for the 18 years that the train has been running. Fed protein bars by the regulators of the train, they are not allowed beyond their caboose car, are perpetually filthy, and are essentially treated like prisoners. Rising up against the hierarchy of the train is Curtis (Chris Evans) and his band of misfits. Tired of the unfair treatment they receive, he embarks on a mission to take over the engine at the front of the train and to win better conditions for his co-passengers. I was immediately intrigued after seeing the trailer for this. It seemed hugely different than the majority of the films out right now and with a star-studded cast--what more could you want!? I was NOT prepared, however, for the massive amount of violence that greeted me in the theater. Good lord. So many deaths. And I mean, I guess I should've seen it coming. No revolution set up in earnest ever really worked without a huge amount of sacrifice--but still. Lots of battles. And they use axes, for God's sake. 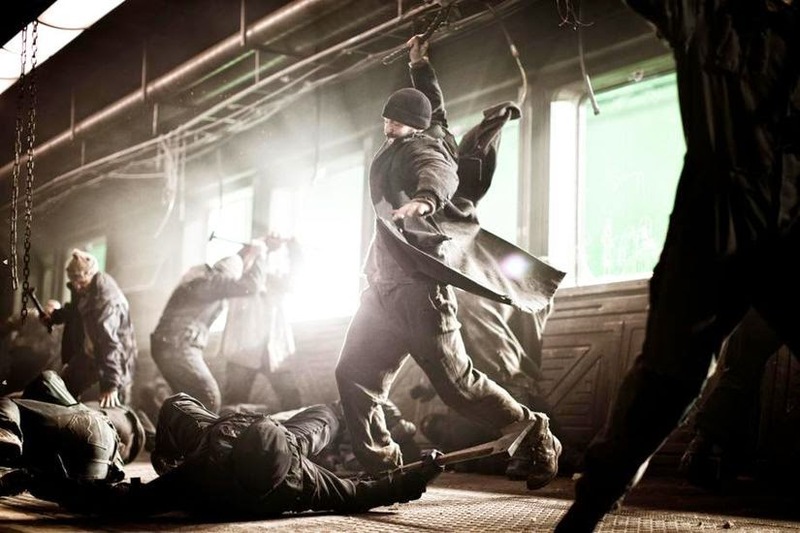 I will say, though, that the fascinating thing about the battles on the Snowpiercer is that they must take place within a confined space, and that they must be mindful of doing the train damage. (I mean, come on, it's their entire life source. If the train dies, no one wins.) Consequently, there are a bunch of wild card battle scenes that take you totally by surprise simply by the way that they are fought. Apart from their revolution strategy, what I liked about this one is that the general plot of the movie is hugely original. The concept of living in a thousand-car train is thought-provoking in and of itself, not to mention the problems that one would encounter in regards to class equality. To be fair, the movie is based on a 1980s French graphic novel called Le Transperceneige, so it's not completely original. (Fun fact: "perceneige" en francais means "snowdrop," like the flower.) But still, as the movie plods on and you move up and up in class and rank, you begin to see the horrendous contrast between the squalor and inhumanity in the last car and the pointless excess of comfort in the first classes. And should you forget, there is a damn memorable tale told by Curtis in one of the final scenes that makes you just...woah. Nothing anyone has ever done could merit the conditions of the lowest class. And having that sort of class contrast wrapped up in something as compact and simple as a train is pretty genius. Jk lolz, it's a train. The train itself is pretty memorable as well. On the journey throughout the train, you go from a car that resembles a shanty town of bunks and rags to an elementary school car to a high-luxury car that houses people in the lap of luxury. 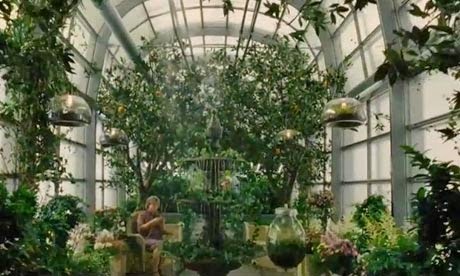 Throughout the train you see things such as how they recycle water, sustain plant life, feed the people, and survive. All in all, this movie was pretty great. Different, refreshing, smart, and chilling. Highly recommend if you're in the mood for an intense ride.